We waited until the little one was 2 years old to book her on a long haul (first flight) to HK which was a good 11.5-12 hours direct flight. 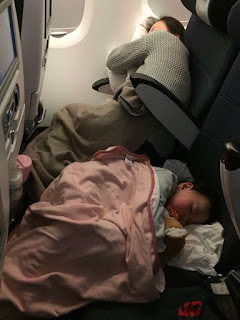 To be honest I was too lazy to fly with her any earlier and the thought of packing, jet lag just gave me a headache also to be holding her on the flight was a no no for me because I usually sleep through it myself and yes the entire flight. 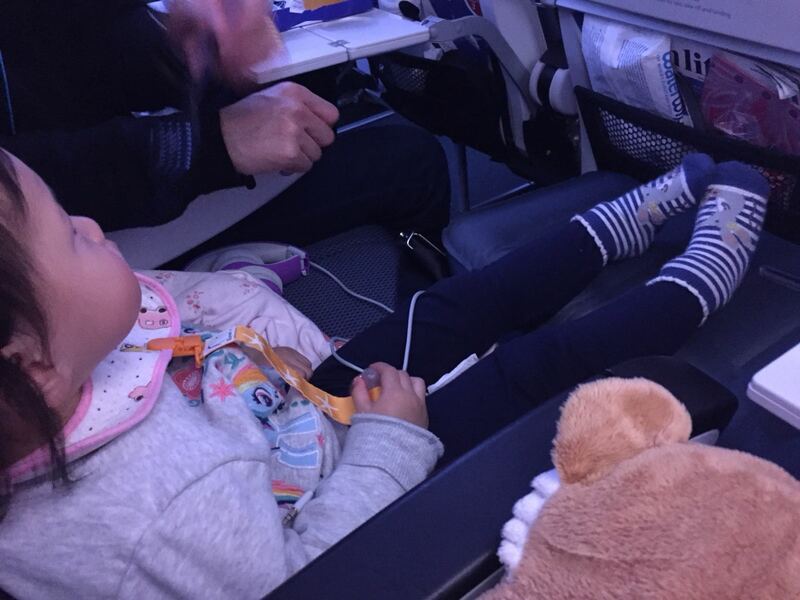 As it got closer to our flying date I started researching / reading lots of blogs for tips on travelling with a 2 year old and what we need to be packing etc... Let me introduce you to this AMAZING Fly Tot which is essentially a blow up foot rest / cushion and it comes with its very own foot pump. 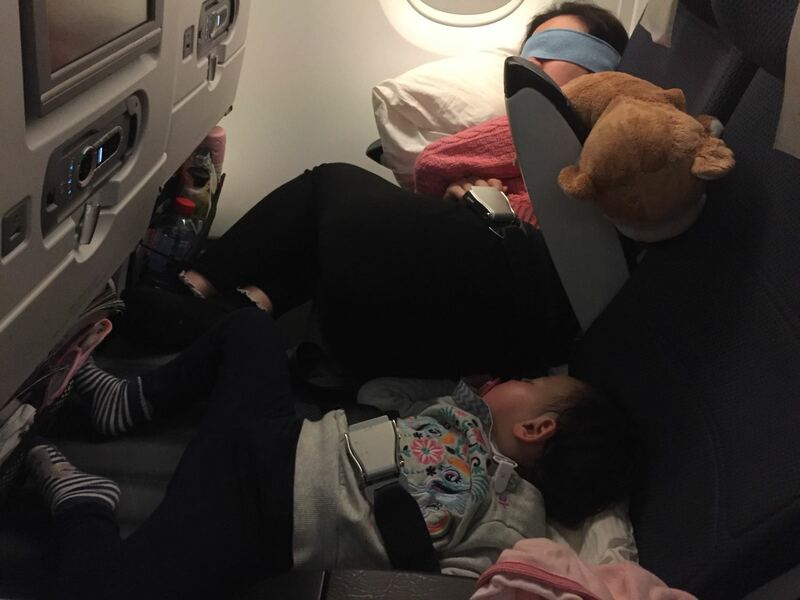 Our flight to Hong Kong departed at 6.15pm, I picked this flight time as I thought it would give us time to settle before bed and the little one would't get over tired as we usually get 8-9pm flights to HK. As we got to our gate waiting for boarding we changed her nappy and into her sleepsuit so she was nice and comfy. We had a bite to eat at the Gordon Ramsay pub so she had a full belly of fish and super chunky chips. 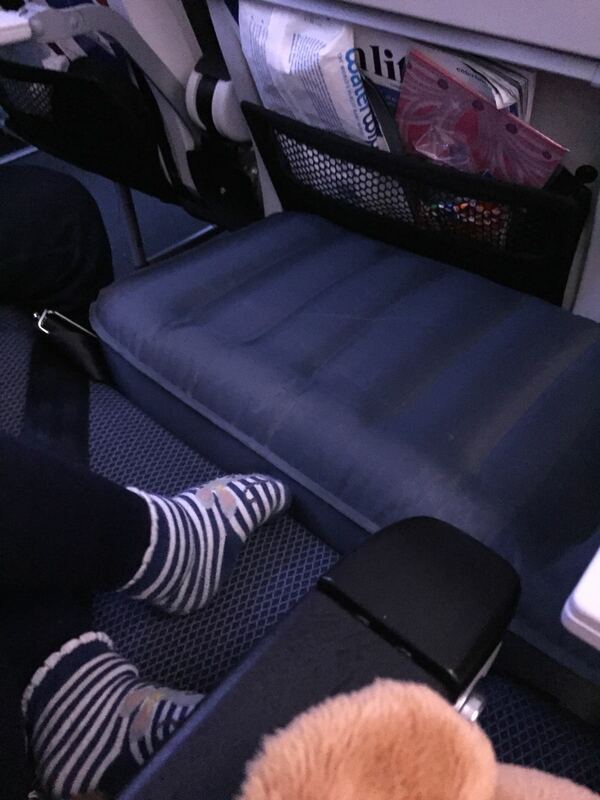 Once we boarded she had her teddy, blanket and pillow (we brought our own) so she was nice and comfy and headphones while we waited for take off. Soon as the seat belt signs were off hubby got out our Fly Tot and started pumping it up so she can rest her feet and get ready for bed. She literally laid down and fell asleep stretched out just like that and slept almost the entire flight until breakfast was half served. The cushion literally sits in the area where you put your legs and it's wedged in so you don't have to worry about it moving around. Seat belts can be put on when they are lying down in sleeping position so you don't have to worry about the seat belt signs coming on and waking them up. I would highly recommend this for flights 3 hours+ as anything over 2 hours they start getting tired and want to move around. If your little one does not sleep it's great just to rest their leg and allows them to have that little extra space to move around or spread out with their toys. I use to have a fear of flying with a kid worrying that I will be up the entire flight entertaining her but now flying is such a breeze. I packed snacks / activity pack for her and they were not used on both flights. We were sat by the window with 3 seats so I had the window seat and she was in the middle. 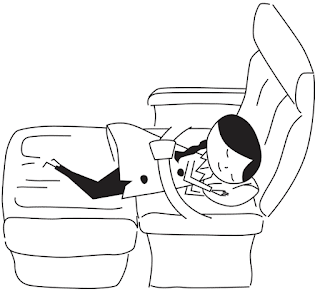 Since she took up so little space it gave me more room to lie down sideways myself and used her Fly Tot as my foot rest which was super comfy. Hubby never sleeps on flights to HK but he managed a few hours from being so comfy resting his feet on the Fly Tot. The only thing left to say is WE LOVE IT!!!!! !